If I cook and you do the dishes, who watches the kids? Keeping track of who has an eye on the kids is one of the hardest, most under-appreciated aspects of parenting. If you’re at a social gathering, it’s so easy to get wrapped up in a conversation and subconsciously pass the kid-watching baton to the other parent. Worst-case scenario: a drowning or kidnapping. Best-case scenario: Parents nitpicking on one another when one feels he or she is carrying more than his or her fair share of making sure the kids are safe and their needs are met. I can’t tell you how many times Ian and I have fought over this. When Julian was a baby, I would get angry at Ian when one or several of his neighbor friends would come over and they would spend hours on the porch, playing music and hanging out. 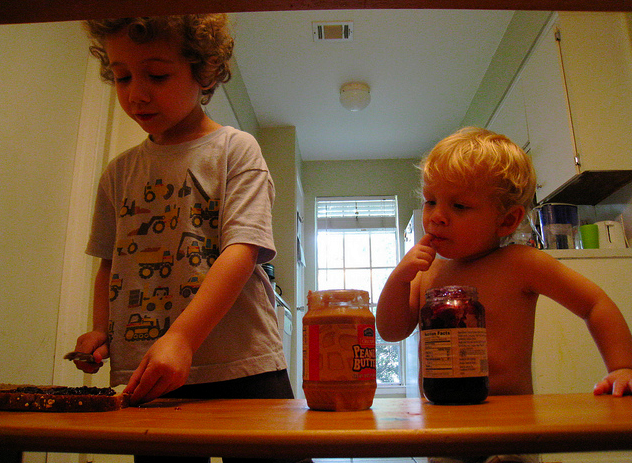 (Julian is now old enough to make a peanut butter and jelly sandwich for both him and his baby brother, above.) Ian has vented his frustration that when we go to a friend’s house for dinner, he is the one who ends up chasing the kids while I spend time with the host or other guests. In past generations and in many families today, this unspoken responsibility falls squarely on the shoulders of Mom, but in today’s Wall Street Journal, food writer Katy McLaughlin shares her family’s dilemma in The Juggle, the print version of the newspaper’s popular parenting blog. In her household, her husband carries the kid-watching burden while she cooks dinner. As her culinary ambitions grew, so did the amount of time that her husband was having to be 100 percent “on” with the kids. She justified the time (and stress and effort and dirty dishes) spent in the kitchen by claiming, rightly so, that cooking dinner is inevitably cheaper than buying food prepared by someone else or going out to eat. 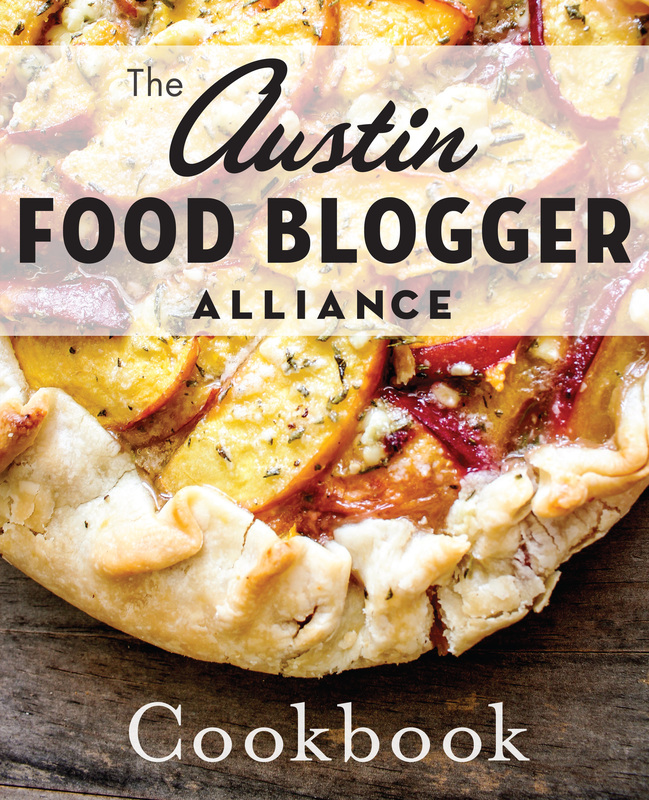 Plus, like many advocates of home cooking, she believes it to be healthier and intrinsically better for her family. But at what cost to her husband’s sanity and the time she gets to spend with her kids? She finally realizes that maybe ordering pizza from Domino’s every once in awhile isn’t that terrible after all, but I’m not surprised that she wasn’t able to come to this conclusion before. As an increasingly food- and parenting-obsessed society, we are putting so much pressure on families to sit around the dinner table every night eating home-cooked meals made with the best-quality ingredients you can afford that we’re forgetting the work, both in and out of the kitchen, it takes to do that. Not just the cooking, but the grocery shopping, the cleaning and, yes, the kid-watching that falls on the person who doesn’t have a knife in his or her hand. We spend so much time away from our families over the course of a week, it’s not such a bad thing to forgo the epicurean meal for an hour or two together, doing something that everyone can enjoy and participate in. If it means you’re eating a frozen pizza, so be it. Enjoyed this post as well as the WSJ article as featured in the Statesman today. My kids are now aged 19 and up and I find myself cooking much more complicated, interesting recipes since I don’t have the push to get food on the table for 3 (sometimes squabbling) boys. I used to say I didn’t cook, I just heated food up. That’s so thoughtful, Linda. I can’t imagine how single parents do it, and I’m sure any extra help, even in the form of someone to keep the daughter company so she can take care of other things around the house, would be helpful. As a non-cook, I am totally down with the idea of sometimes de-emphasizing what the family eats for dinner! I agree that there needs to be a balance between running yourself ragged cooking every meal at home vs. spending quality time with the kids. Now that I have to cook and watch (and clean up), a frozen meal here and there keeps us together as a family. When ever possible I get the kids to help me cook, even my 2 year old helps! I like the code word idea; it saves a lot of time spent on sharing feelings at the end of the day when everyone is tired. Another suggestion is to make extra rice, pasta, beans that can go into many forms of meals and it will be the start of another meal instead of starting from scratch. Another idea to keep the kids in sight and out of the way: Put a plastic table cloth on the floor and let the kids use dry beans or pastas to play with (bowls, cups, pots, etc.) while you are fixing dinner, (unless they can be of help). It is an easy cleanup as well. Taking turns is the best solution if both partners are game. Sometimes one is home earlier and that dictates who starts dinner. Getting the kids involved helps with the simpler tasks if you have patience and don’t worry about the presentation! Good luck! !